Цена коштања овог програмчића није у новцу већ у међузависностима (успут, програм је бесплатан и слободан). Да би радио, на рачунару мора да буду инсталирани ActivePerl (или нека друга имплементација Perl-а за Windows систем), Win32::API и ImageMagick. Преузимање пакетића у ZIP архиви величине 15 KB са доњег линка за преузимање. WinPWC or Windows Perl Wallpaper Clock is Perl script that compose desktop wallpaper for Windows XP with components from Wallpaper Clock. Composed wallpaper is saved as C:\Windows\wallpaper.bmp and is then set as an active desktop background. This process updates once time per minute, in order to simulate clock. The price of this software is not money-like, but in dependencies – this costs no money and is free (free as beer and free as freedom), but there are some dependencies. To make it work, WinWPC requires ActivePerl (or other Perl implementation for Windows), Win32::API and ImageMagick. 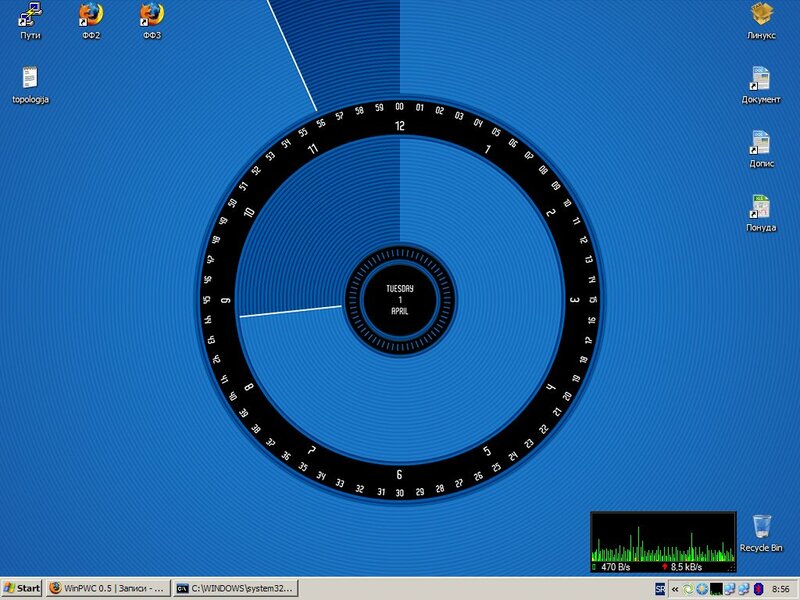 WinPWC or Windows Perl Wallpaper Clock is Perl script that composes desktop wallpaper for Windows XP with components from Wallpaper Clock. Composed wallpaper is saved as C:\Windows\wallpaper.bmp and is then set as an active desktop background. This process updates once per minute, in order to simulate clock. Ееее, јбг, нема за Линукс :D Мож’ да преправиш ове путање у WinPWC да се користе одговарајуће у Линуксу, па ће да ради (ваљда? ), а можеш да користиш и Wallpaper Clock Screenlet за Гном или Wallpaper Clocks for KDE. Nema na čemu :) Hvala tebi na linku! Имаш грешку у вези ка виндовсу икспе. После бриши овај коментар. Хвала Милане, веза ја исправљена.